Here at Derby Derm, it isn’t only about the weight you lose. It’s about the total transformation of mind, body and soul. It is a way for you to regain control of your health and fight the disease of obesity. You can reduce weight without painful, invasive procedures. You will not be encouraged to purchase expensive pre-packaged meals or shakes. We teach you how to use real, fresh foods that don’t interfere with everyday life. We offer a medically supervised program created by experts in nutrition and fitness. Our three phase approach to includes FDA approved appetite suppressants (if prescribed), dietary supplements and vitamin and mineral injections along with nutrition and exercise counseling. Your initial visit will include nutrition consultation and a nutrition plan as well as exercise recommendations. We will measure your weight, body fat percentage, waist circumference, resting metabolic rate (how many daily calories it would take for you to maintain your current weight without exercise) and perform a comprehensive blood panel. You will receive a medical consultation with our provider, a vitamin and mineral injection, a prescription for appetite suppressants (if prescribed) and a one month supply of dietary supplements. Following the initial visit, you will come in for weekly follow- up visits. These visits offer education and support as you pursue your health and fitness goals. We measure your weight, body fat percentage, waist circumference and resting metabolic rate. You receive vitamin and mineral injections and a refill of their appetite suppressant prescription. Avoid costly doctors’ visits due to knee, ankle and back pain, diabetes, high cholesterol and high blood pressure- all of which can be caused by excess weight. Our goal is not only to help you lose weight*, but to give you the skills that are essential in maintaining your weight loss* and live a healthy lifestyle. Our medically Supervised Weight Loss program starts with an initial visit to get you started on your weight loss journey. You will then come in and visit us weekly to follow-up, get advice and stock up on your weight loss necessities. • Nutrition Consultation and Nutrition Plan. • Measurement of Weight, Body fat percentage, Resting metabolic rate, & Waist. Once you have reached your goal you may find it helpful to visit us for maintenance. After your reach your goal weight with our program, we will educate you on how to eat healthfully long term so that you can keep the weight off. 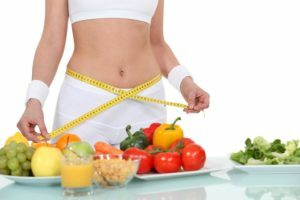 You will also be able to continue to come in weekly for a Vitamin Injection Visit to assist in your weight maintenance. See Vitamin Injection Visit information for costs. • B12 which helps with increasing energy, decreasing stress, fat metabolism and immunity. • M.I.C. (Methionine, Inositol and Choline) which helps with fat breakdown, energy and healthy hair, skin and nails. • Chromium which helps with balancing blood sugar, decreasing hunger and decreasing cravings. • B6 helps with energy, water retention, PMS and increases positive mood. At each visit, you can add additional B12 and B6 for a “Super Shot”. The Initial Vitamin injection consultation is a 15 minute appointment and includes that week’s standard injection. Then you can come in weekly to receive your standard injection, which takes about 5 minutes. 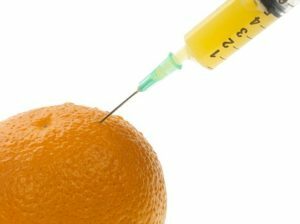 Vitamin injection can be done in conjunction with the weight loss program or by themselves. In the year prior to discovering Derby Derm, so many things happened in my life. My father was diagnosed with cancer (he is now cancer free), his brother struggles with diabetes, and I was becoming someone I didn’t like to be around. Unmotivated, negative, a Dr. Pepper and sugar junkie, and was worried about what my being overweight was doing to my health, and worried about my family things as well. For a while, I would go to the gym, but it would hurt my knees, or I’d feel out of place. About a week before I turned 34, I saw a coupon in the paper for Derby Derm. 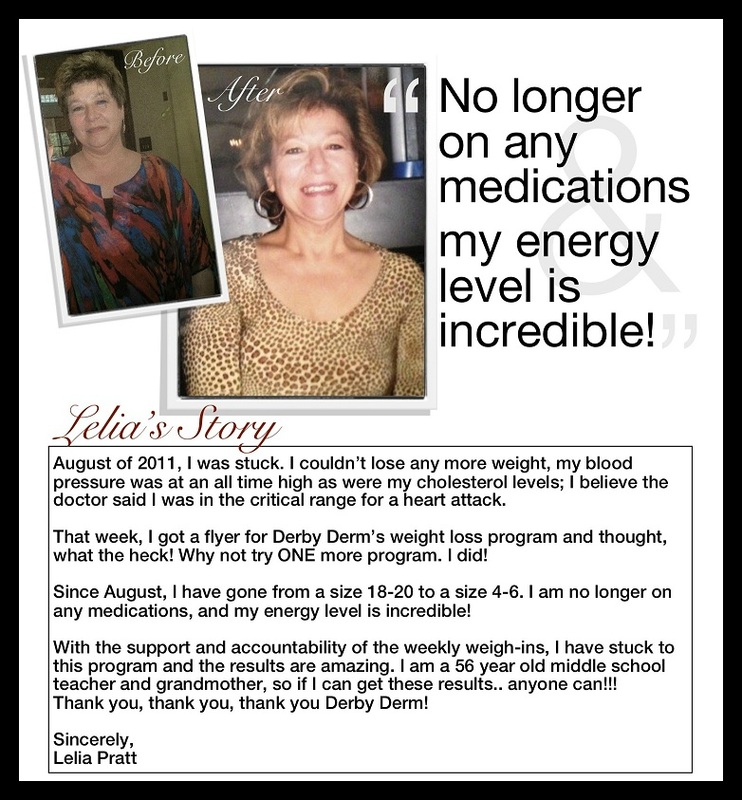 It was a special they were running for a discounted weight loss consultation with blood test and all the works. This was what I needed! I had just gone shopping the day before to pick up some new pants and shirts. I refused to make the clothing purchase because I would be getting a size 20 pants and a shirt with yet another X before L! I wanted to go and get the blood work done and see how my numbers were, to see what I already knew. What I found when I went there was a plan that I could follow, great people to cheer me on and guide me through the struggles I would have along the path to becoming the person I am now. I can tell you that the person I am this minute is not the same person I was mid- February. I am more positive, energetic, and my body just feels clean. Clean of the bad foods, sugar, soda, and the depression I would feel when I would eat fast food more than once a day. I never imagined that I would be this person. I also don’t have to wear glasses anymore. My eye doctor told me that sometimes nearsightedness can be caused by sugar buildup on the cornea. Apparently that’s what caused mine! My original goals have been far surpassed…I wanted to go to the gym a few times a month, but now I go a few times a week (and hate it when I can’t make it)! I’m eating the right foods, and the right portion size. I don’t wake with back pain, or get knee pain from exercising. The benefits to weight loss and good meal planning are amazing! The thought of soda now make my stomach turn. I’m now looking to help my family out and show them what I’ve learned, so they can see how I’ve changed, not just the physical person they see, but my habits as well. I love shopping even more today, eight months after starting the program. I just purchased a size 8 skirt and a size small shirt and sweater. I can’t thank Derby Derm enough for offering this program. It has truly changed my life in so many ways!